Imagine having the resources within you to start every day full of energy and vitality, and end each day without stress or emotional tension. What’s more, imagine how amazing it would be to have the power to heal yourself, prevent illness, and feel connected to the universal energy all around you. With just a little commitment to your own internal energy, you will soon see what the power of qi can do for you. With health-care costs going through the roof, our health insurance in crisis, and our medical doctors taxed and depleted, it’s reassuring to have the tools and resources to heal your own body and take charge of your own health. It’s an amazing experience to know that each and every one of us is our own best healer, and that we can discover the answers within. 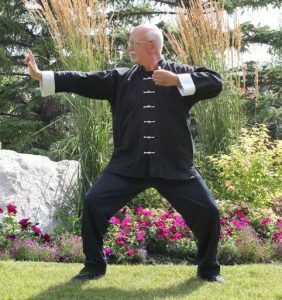 Qigong is one of the most powerful systems of healing you can do for yourself. You are a gift to me in my life, through the path you chose in demonstrating your presence and strength. Before I met you, my psychologist was encouraging me to "go back on my meds" for anxiety and depression. I resisted, hoping for another way; a way to heal and not simply to mask. Right after that session I came to your Qigong class on a whim. After my first two weeks of practicing Qigong I returned to my psychologist and excitedly told him that I had experienced a dramatic shift in my outlook, and a building sense of joy in my life. I'm happy to say that his response was positive. What followed for me was two months of almost daily (sometimes twice daily) of Qigong classes. I will always remember those two months as a watershed in my life. You have powerful gifts, Mario. Whatever the future holds for you, know that those gifts found a way to shine into my life, and I will be grateful to you for that for as long as I live!